9 Top Hard Carrying Cases For AR 15 Reviewed. Keeping it in a Rifle Case is an absolute necessity. It’s necessary not only for your rifle’s sake. But also for ensuring the safety of other people who might come into contact with it. Get a solid gun case that you can rely on. Don’t cheap out on it. The thing is – there are expensive cases and there are cheap cases. How do you know which one to go for? Does it make sense going with the cheapest case? Or should you pay a bit more for the quality? We’re going to answer all of these questions today. Our Pick: Plano All Weather I is probably the best hard AR 15 case on the market for you. Weatherproof and sturdy, this case offers great features at an affordable price point. In other words – with Plano you’re getting a lot of value without paying for it too much. Budget Choice: If you’re on a budget, you’re going to love Flambeau 6500AR. It’s a basic AR 15 hard case with no frills attached. If all you need is to transport your rifle to the range and back, Flambeau is your best choice. 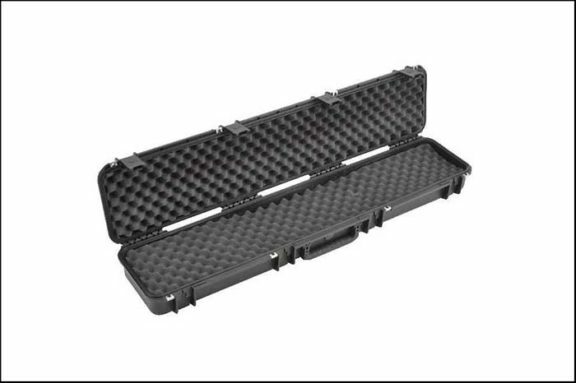 Professional: Check out SKB iSeries and Pelican if you’re looking for a premium tactical case for your AR 15. They’re both top of the line cases that are unbreakable and 100% weatherproof. With their best-of-class build quality, either of these two cases will probably last you a lifetime. The easiest way to tell whether or not you need an expensive case is by looking at the value of your gun. A Plano case for less than $100 will most likely do just fine for you. Especially if you’re only going to range and back. On the other hand, if you have a gun that’s worth $1000… then you should seriously consider dropping a couple of hundred on a Pelican or SKB. It’s well worth it. AR 15 comes in many different sizes. Measure the length of your gun before buying the case. If you need to pack extra gear, go for a larger case. Side note: This should be obvious, but you’d be surprised how many people don’t know the exact length of their AR. Note that case length goes both ways. Unless you’re packing a lot of extra gear, you might not need that heavy 50-inch case. Because the weight on these things adds up – fast. Is Your AR-15 Scoped or Not? Let’s be honest – removing the scope and putting it back every time you want to transport your rifle is a pain. So, if you have a scoped AR 15, remember to measure the height of the rifle together with the scope. Then, make sure that the internal dimensions of your case are big enough. With that being said, most cases will fit a scoped AR 15 rifle. If you travel from one state to another with your gun, keeping it in a hard case is a must. The thing is, not all rifle cases are TSA approved. And even on the approved ones, you’ll have to get special padlocks to pass the security check. I’ve noted which cases on this list are TSA-approved and which ones are not. Also, remember to check the gun laws in the different states you’re going to. One: When your rifle is locked away in the case, no unauthorized users can access it. You can keep your weapon under control even when it’s not in your reach. Soft cases are less secure because they can be cut, meaning that you’ll constantly have to keep an eye on it. Two: When traveling, your rifle will get bumped around and scratched. Especially with scoped rifles, that can be a HUGE problem. Getting a proper hard case for your rifle will eliminate that risk completely. You don’t have that with soft rifle cases. 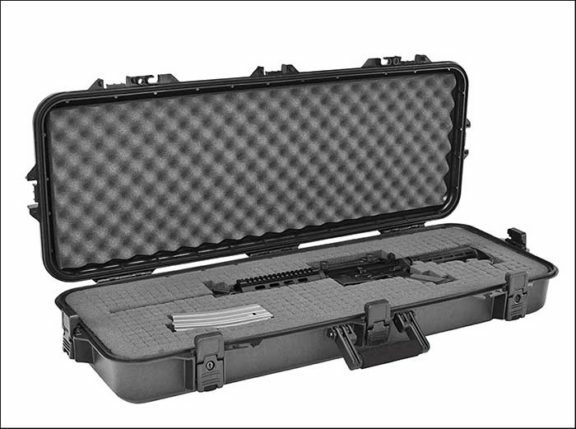 Plano All-Weather I is the best hard case for your AR-15 currently available on the market. Plano All Weather I is completely weatherproof. Your gun is 100% protected from water and dust inside of this case. The case is made out of thick, sturdy plastic. It barely bends when you press it down. It’s not Pelican-tough (see below), but tough enough for most purposes. For locking, there are a total of 5 latches – 3 latches in the front and 2 on the sides. 2 of the front latches have integrated keyed locks on them (keys included). The latches are easy to release and feel strong with minimal play. There is also a pressure release valve that will equalize the pressure inside the case. This case is TSA-approved and airline-approved. You can travel with your gun inside of this case. Note: For air travel, you’ll have to get yourself TSA-Approved Padlocks as the internal lock of the case is not good enough to pass the airport security. As with all Plano cases, this one is Made In The USA. They print it on top of all their cases, which I’m sure any patriot will appreciate. Inside the case is a fully customizable pluck foam. The foam is dense and easy to use. You can either pick & pluck, or use a knife to get a more precise fit. Check out the video below to see how it’s done. What’s great about the customizable foam is that it gets you a perfect fit for your gun and any accessories you want to include (handgun, extra mags etc.). So that they don’t move around inside the case while you’re carrying it. The hinges on the back can be destroyed or compromised if you really try – especially with tools. The integrated lock on the front latch doesn’t feel secure – it could be picked or destroyed easily. With this case, you should get hard padlocks to keep your gun secure. Plano is a good carrying case, but it’s just not enough to secure your firearm 100%. 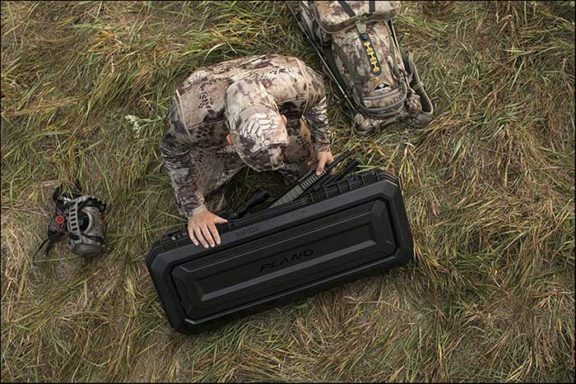 Plano’s All-Weather case is probably the most popular rifle case on the market. It’s got great reviews on Amazon and elsewhere. And it’s easy to see why. You’re getting massive value for what this case costs. A fully weatherproof, customizable gun case for less than 1/3 the price of a Pelican? It’s a bargain, no matter how you look at it. And even considering the downsides that I outlined above, I wouldn’t be surprised if this case lasted me a lifetime. They’re built real good. Side Note: Plano has released an updated model of this case called AW II. However, the new model has a potential waterproofing problem, which is why this one is still #1. I’ve reviewed AW II below. SKB iSeries is for you if you want something stronger than a Plano for your AR 15, but you can’t quite afford the Pelican. It costs a little more than a Plano. But in my honest opinion, that extra money is well worth it. SKB iSeries gets you all the features and durability of a Pelican (which is arguably the best rifle case ever made). But it retails at about half the price of a Pelican – and this makes it a real winner for me when it comes to value for money. Because this case is built like a tank. When I first tried it, I was surprised at the rigidity. I couldn’t get this case to bend even while standing on top of it (I’m about 220 lbs.). For locking, there are four latches with lock holes that open and close easily and securely. The latches are reinforced with stainless steel, which is something you won’t see on a cheaper case like Planos (and others included below). Inside the case there’s rigid, customizable foam. The foam is not pluck & pick, but it’s very easy to cut with a knife. I even prefer it this way, because I can cut out exactly what I need and get a tighter fit for my rifle. Just like its twice-as-expensive brother Pelican, SKB is made with military grade design (MIL-STD-648C) and is suitable for air transport. The case comes with an inbuilt pressure equalization valve. Best of all, the SKB case comes with a lifetime guarantee. The biggest downside of SKB is the size. At 49 inches the case will be a bit large if you only need it for your AR 15. This case is also heavier than most other rifle cases that I’ve used. Finally, the cheaper price means more quality control issues. I’ve read the reviews and it’s mostly small things that people complain about. Unfinished plastic bits etc. – couldn’t find any serious complaints. 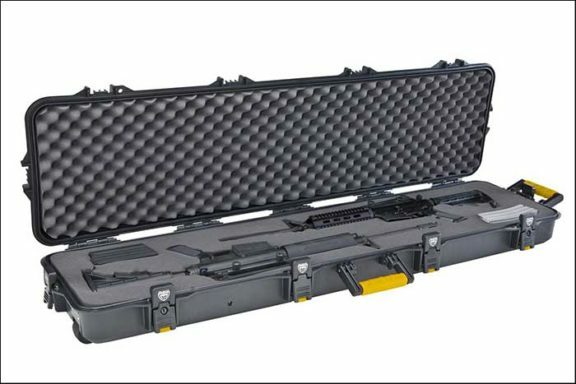 A buy-it-for-life rifle case for half the price of a Pelican? Where do I sign up? 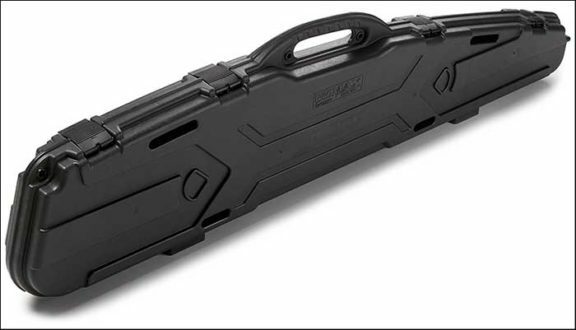 But all jokes aside, you won’t find a better rifle case than SKB iSeries for the money. As it stands, the case is a bit large for AR 15 specifically, which is why Plano remains our top choice. But if they made a smaller version for AR 15, SKB would easily make it to the top of the list. Pelican is the benchmark of quality when it comes gun cases. This is the case that all other rifle cases are compared to. 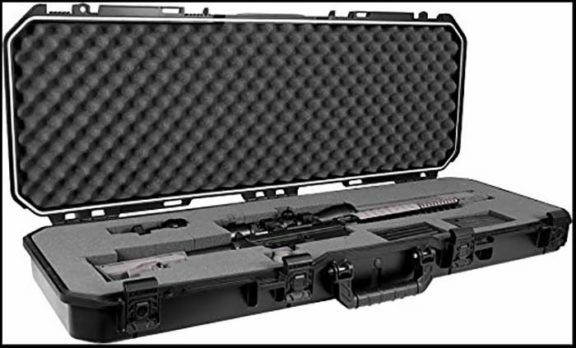 Go with Pelican if you want to have the absolute best hard case on the market for your AR 15. 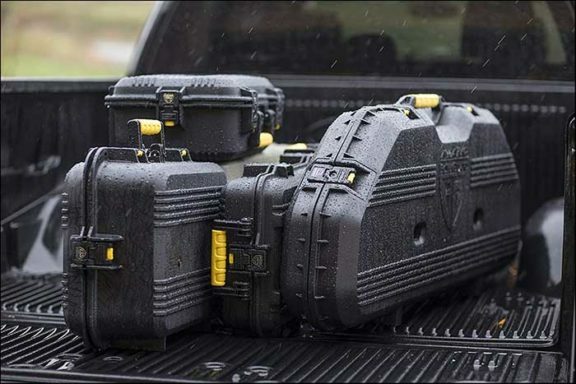 Pelican cases are built to military specifications. It’s waterproof, dust-proof and crash-proof. You get everything that you could possibly want out of a gun case. Most importantly, Pelican is an extremely tough and secure case for storing your firearm. I stood on this case (I’m about 220 lbs.) and it didn’t give in at all. It’s almost indestructible. You’d need an industrial saw to get through this thing. Or a blow-torch. I can’t say the same about Plano. 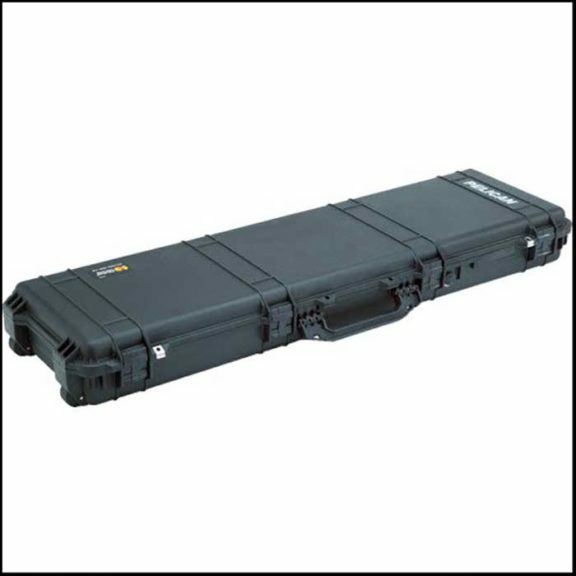 At 50 inches in length, Pelican is also way bigger than other cases (that are usually 40-42 inches long). Everything will fit in here with room to spare – extra handguns, mags, scopes etc. From the inside, the customizable foam feels very nice. You’ll have to cut it with a knife – this ain’t pluck & pick. Oh, did I mention that Pelican is Made In America and comes with a Lifetime Warranty? The large size makes Pelican heavy. Not too heavy – but I’d rather have this case sitting in my car than be walking around with it. And besides from the size, there is not a single downside I can find with Pelican… except for the price, that is. Because not everyone can afford to drop a few hundred dollars on a gun case. With Pelican, there is that certain satisfaction of knowing that you have the absolute best rifle case on the market. That once you buy this case, it’ll last you a lifetime. So, if you decide to go with Pelican, it will be the only rifle case that you’ll ever need. 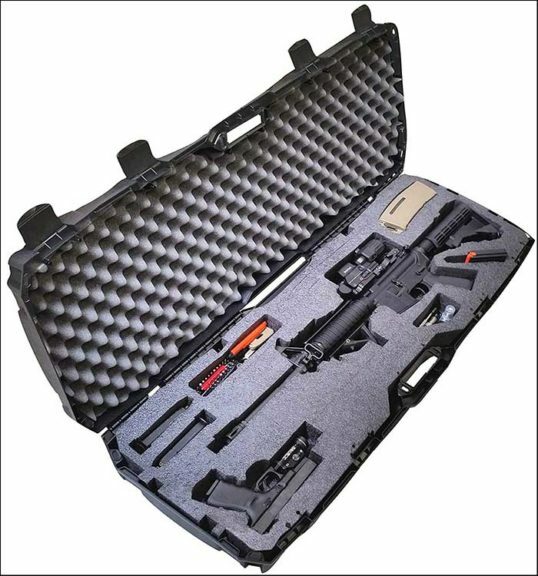 Pelican gun case is a buy-it-for-life item. Of all the AR 15 owners that I know that have Pelican cases, not a single one regrets buying it. Versus saving their money getting a cheaper case. With Pelican, you’ll pay a few hundred bucks up front… and enjoy the luxury knowing that your AR 15 is resting in the absolute best rifle case ever made. Probably, for the rest of your life. 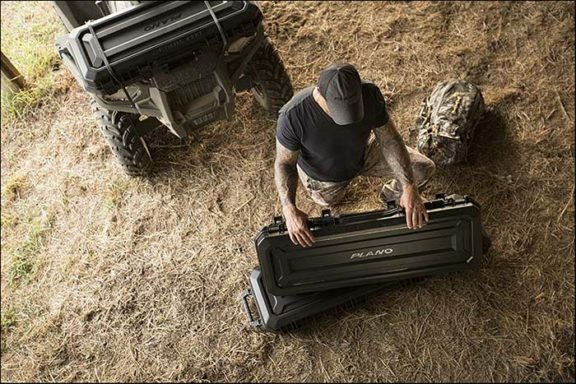 Plano “All-Weather II” is an upgraded version of the “All-Weather I” case. The main changes here are in the handle and case design. What’s surprising is that they didn’t include any new features. Both AW 1 and AW 2 cases are nearly identical with what they offer. If anything, the old one feels a little sturdier than this one. I’ll give it to them – the handles feel more comfortable and the case just looks better overall. I have some doubts about the waterproofness of this case. 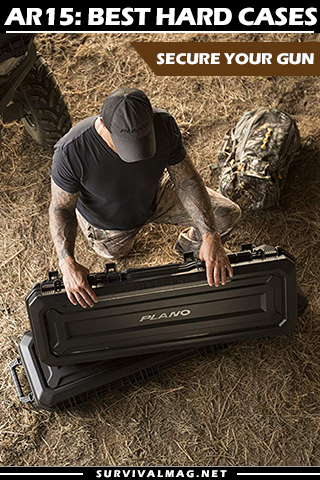 The first model of Plano’s all-weather case has two of the handles on front and two of the handles on the sides. The sides are compressed, and so is the front. No water gets in. With this model, as you can see from the image, Plano moved all of the 4 latches to the front of the case. As a result, there is nothing compressing the sides when the case is closed. With serious downpour, or if your case ever gets submerged, water will get in. And that’s just not acceptable. I was unable to reach Plano for comment on this. Get the All-Weather I while it’s still available. AW II is not worth the money for me – at least as long as Plano hasn’t solved the waterproofing problem or convinced the customers that it’s not an issue. Flambeau 6500AR is the best budget AR 15 case on the market. By “budget” I mean that it doesn’t get cheaper than this. One thing you should know about Flambeau is it’s not a Chinese fly-by-night company. They’ve been making rifle cases for major brands for decades. So, even though it’s not the best case out there, I expect them to have decent quality control. And 6500AR is a decent basic case for the money. It’s good for transporting your rifle over shorter distances, which is what you’ll most likely be doing most of the time anyway. Considering how little this case costs, I feel bad comparing it to more expensive alternatives. Still, here are some of the shortcomings that you’ll get. This case is not weatherproof. Don’t leave it out in the rain or the water will get in. Instead of customizable foam, this case has velcro straps to keep your gun in place (there is still softening foam around the straps). While this works in most situations, I wouldn’t travel with this case or treat it too rough. And finally, the plastic of this case is on the thin side and the latches feel more flimsy than Plano’s. Again, considering the price I can’t complain, but keep in mind that you shouldn’t bang the case around too much. Flambeau 6500AR is a cheap, basic AR 15 case that gets the job done. You don’t need more than this for transporting your rifle over short distances – for example to the range and back. But if you’re planning to take your rifle out in the woods, or ship it anywhere, this is not a case for you. While I would personally go with a Plano because it’s waterproof and stronger, Flambeau is your best choice for a hard AR 15 case when you’re on a really tight budget. Pro-Max Contoured is Plano’s budget rifle case. It’s very similar to Flambeau in terms of features and pricing. The only difference between them is that Plano’s Pro-Max case is much longer at 51 inches. The gain in size somewhat evened out by the contouring, as the squeezed form means that there is less space inside. As all Plano’s cases, this one is Made In America. But don’t be fooled – don’t expect superior quality because of that. And that’s really all it does. A decent basic case that will be good enough for most people out there. Now, let’s talk about what you’re not getting for the cheap price. The lock holes are easy to damage. They will stop children from opening this case, but I wouldn’t be surprised if you could use a screwdriver to break them. You’re better off going with Flambeau’s budget case for your AR. Pro Max is too long at 51 inches for a standard sized AR and I would only consider it if you’re packing a lot of gear in addition to your rifle. This case is Plano’s double-rifle version of the All-Weather case. It can fit two scoped rifles or shotguns, which is great if you want to carry your AR 15 with another rifle. Or if you have two rifles, for example. As the normal All-Weather case, this one is waterproof, airtight, and dust-proof. It’s airline-approved and includes an internal pressure-adjustment valve. And you’ll love the included wheels – they’re lifesavers. Because I can’t overstate how heavy this case is – we’re talking two rifles and 55 inches in length, after all. As with all Plano’s cases, this one’s Made In America. The only downside of this case is that it has an exceptionally tight fit for two scoped ARs. If you have two big scopes, you might have to remove one of them. Otherwise, your rifle will sit too close to the edge of the case and that’s not good. 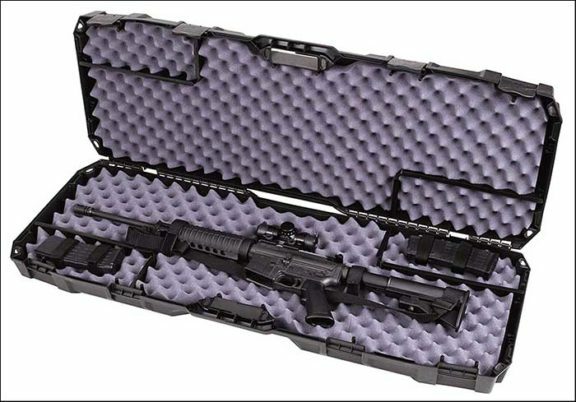 If you’re transporting two AR rifles, this case is as good as it gets for the money. Plano delivers as usual. Keep the heavy weight of this case in mind, but also the fact that you might have a hard time fitting two scoped rifles in there. That’s right, it’s an AR 15 guitar case. Straight out of Mariachi. Even if you have nothing to hide… sometimes you just don’t want people on the streets to know that you’re carrying a rifle. Especially with the current debate about gun rights going on. You don’t want to stick out too much on the streets. So let’s take a look at what we have here. This is an actual guitar case. Built at an actual guitar factory. So, the only thing makes this case different from a normal guitar case is the foam that they put inside there. Now, I don’t know if you’re familiar with guitar cases or not, but they’re strong. This case might just offer you better protection than conventional rifle cases. After all, the guitar body is only made out of a thin piece of wood. It’s way more fragile than your AR 15. 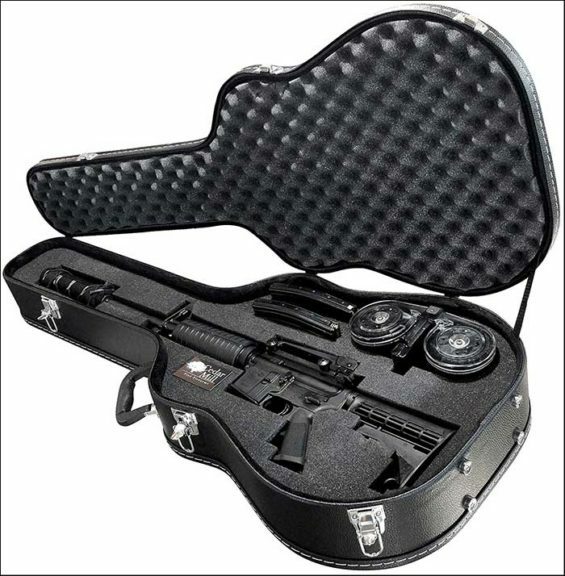 Therefore, if the case can protect the guitar, you can be 100% sure that it can protect your AR 15 as well. Since this is an actual guitar case, it won’t protect your AR 15 from thieves. There are no locks attached. This case is obviously not waterproof. Most importantly, make sure that you triple-check the legality of these cases in your state. The TSA won’t let you board a plane with a rifle in your guitar case either. You’ll be the real-life Mariachi with this case. And although I didn’t get it because of the hefty price tag… I can see the appeal. Case Club AR 15 cases are very popular on Amazon. It’s one of the best-selling AR cases out there. This case is actually a Plano All-Weather Case with pre-cut foam. They even have Plano tags inside and on the handles. Pre-cut foam is the only thing that makes this case different from a regular Plano case. Everything else is the same. These guys take regular Plano cases, outfit them with customized foam, and sell them for about double the price. Heck, Case Club might even be a subdivision of Plano. The bottom line is – you shouldn’t be paying $40+ for pre-cut foam. That’s just way too expensive. Especially considering that the normal Plano case comes with Pluck & Pick that is easy enough for anyone to use. So, if you don’t want to mess around with cutting the foam and have money to spend – go ahead and check them out. But if I were you, I would go straight for Plano and do customizing myself. I don’t like to preach. But having a case for your AR 15 is essential for keeping your family safe and safeguarding your gun from the thieves. Especially when there are so many budget cases available that get the job done, You Have No Excuse to not have a case for your AR 15. So, if You’ve been carrying your AR 15 around without a case so far… please do yourself, your family and your community a favor. And get a good, solid, reliable case for your AR rifle. Even the cheapest case will go a long way in keeping your gun safe. From both Children and anyone else that might want to get their hands on it. Finally, If you have tried any of the cases on the list, please share your experiences in the comments. And help your fellow gun owners make the right decision when buying a hard case for their AR 15.